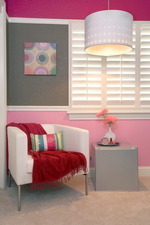 Similar to your own room, a child’s bedroom should provide a cozy and nurturing retreat. Follow these simple steps to take your little one’s bedroom design from concept to completion—ultimately creating a space they will love. Pick your scale of measurement (1/4”=1’ works for most scenarios) and measure the room from wall to wall. Use your measurements to draw the room’s perimeter. Measure doors, closets and built-ins from the outside trim. Note whether doors open in or out. Note window heights, as well as window distance from the floor, as you might want to put cabinets and window seats below; also, measure and note the window height and width inside the window trim, as you may want to hang a window shade. Measure the main ceiling height, noting any archways or anything else impeding the space such as a soffit. Now it’s time to get creative and craft the heart of your bedroom design. Involve your child in the planning process; the design should be a reflection of his or her personality. Start with a comfortable bed that inspires hours of relaxation, dreams and contented sleep. Although your child is probably still small enough to fit in a twin bed, consider a full- or queen-sized one, which is ideal for reading stories together now and keeping ahead of future growth spurts. Make the bed the focal point of the room; then, add other essential pieces including a nightstand, dresser and desk. 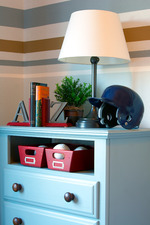 Finally, determine whether you have room for additional pieces like a bookshelf, armoire, toy chest or activity table. Ask your child about his or her favorite colors and activities. Have them help pick out sheets and a comforter that ties into these favorites. Be sure to let them feel the fabric—touch is one of children’s most acute senses and they love feeling different textures. Next, select three hues from the bedding—a light, medium and darker tone—and use these as the foundation for your color palette for the rest of the room. Small details give the bedroom its unique personality. Choose a few fun pieces of wall art that tie back to the theme of the room; add a plush rug to provide a soft surface for play; try some novelty pegs on the wall to hang pajama sets, robes or jackets; and look for fun buckets, baskets or shelving to provide storage in an aesthetically pleasing way. Will your child be sharing the bedroom with a sibling? If so, plan this into your design and consider space-saving furniture like a bunk or trundle bed. 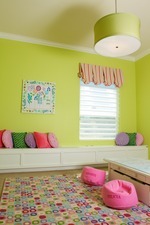 Each child can still display their individual personality in the room with color and bedding choices. Finally, plot the desired items on your original floor plan. Each approved piece can provide the road map for prioritizing your purchases. You can even develop a spreadsheet with pricing to serve as your shopping list or working budget. The most challenging installation items include furnishings that may need to be assembled, lighting, paintings and window coverings. Unless you’re handy, leave this to the experts and include their labor charges in your pricing projections. Because of your step-by-step planning, your child will now have a special space to spend precious hours playing, learning and dreaming. Relax and enjoy!